I have one quilt that I can now show. It was a gift for my mom. I started piecing these 20 scrappy blocks in late October, right before heading to Houston. I think people think that just because blocks are scrappy, that they are fast to piece. Not so much true. I still cut strips off of nearly every pink fabric I own! My niece pointed out that one of the seams looked crooked. I had to gently tell her that they all were :-), intentionally! It finishes at about 58"x 72". It is fun for me to see all the different fabrics that I have used somewhere, or dreamed of using! My mom has had 3 of 4 of her chemo treatments for breast cancer. We are lucky, as it is believed that it was really caught in early stage, despite it being in the lymph node. It is hard to see, but the setting stones on the sashings is a subtle use of the breast cancer ribbon fabric. I didn't want it to be "in your face", but that gentle reminder of why we must believe all will be fine was a requirement. It is backed with a soft pink flannel. This is just one of the many reasons why I have been on the blog less this fall. Too many things to do, or to think about. I will do better in 2014. I tested out a plan and some dimensions for a faux piped binding on this quilt. The brown "Believe" is from a Buggy Barn older print that I have intentionally hoarded. It looks nice with the pink. I love the subtle touch of the piping. I will share the recipe for this later, as it is part of an article I will have published later this year. Just before Christmas, I worked on a client's custom quilt. She has a larger version of this Patchwork of the Crosses block which I have made a dozen or more of. Her's are not fussy cut, but are of lovely bold prints. I won't show the entire quilt, but here are a couple snippets. I love the colors in this block in particular. If you know of the print at the corners (blue/green), or better yet have any to sell me, let me know. I did have some, and really want some. I believe it is Philip Jacobs. This particular quilt was challenging. The oddly-shaped white spaces were perplexing to design for. I sort of ignored the piecing to some degree, and just quilted. It was requested that the quilting be non-traditional and more edgy (like the modern, lively fabrics). 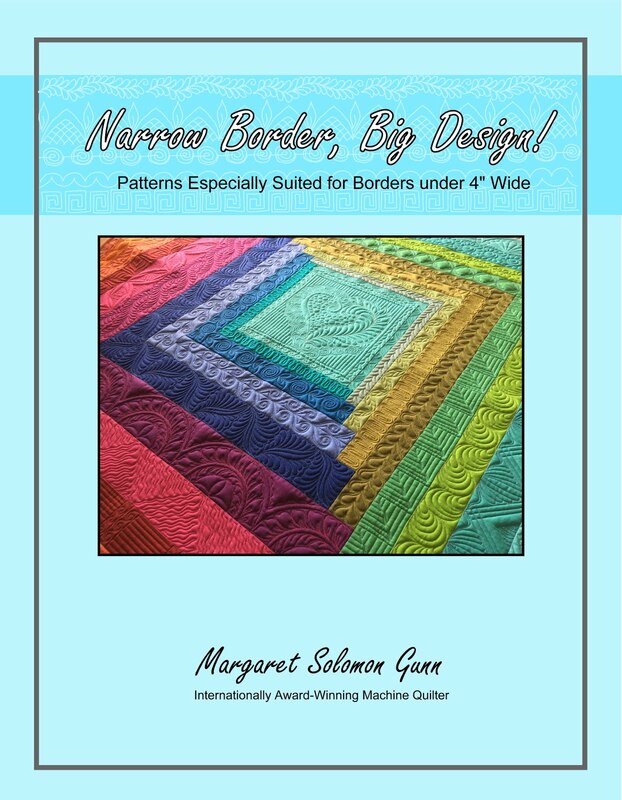 I hope my "outside the box" approach to the quilting fits this request. 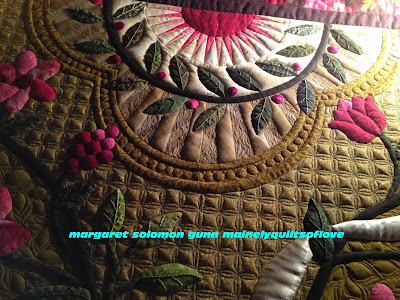 I found another perfect quilt for the Aurifil thread I got last summer - who knew? 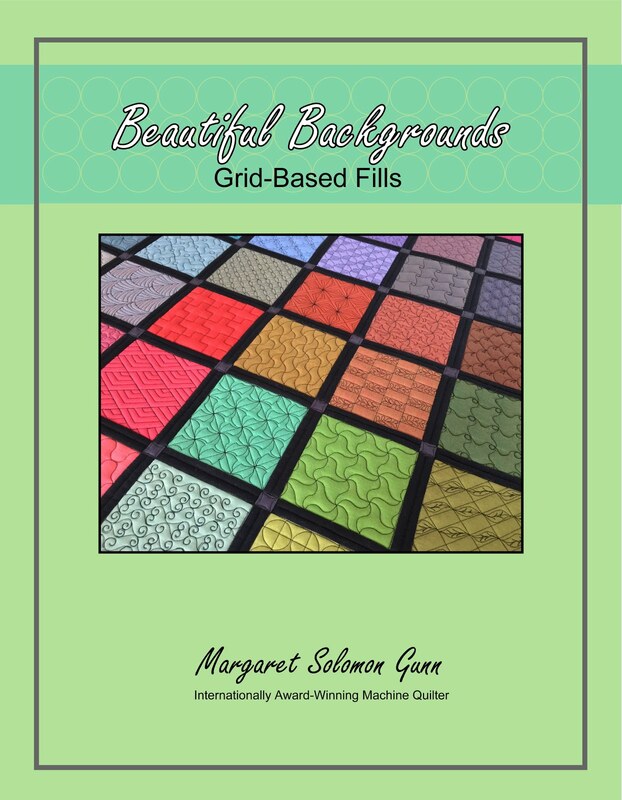 !...it is the one below with the variegated colors - I used this predominantly on the printed areas. There was some white thread and some aqua as well. 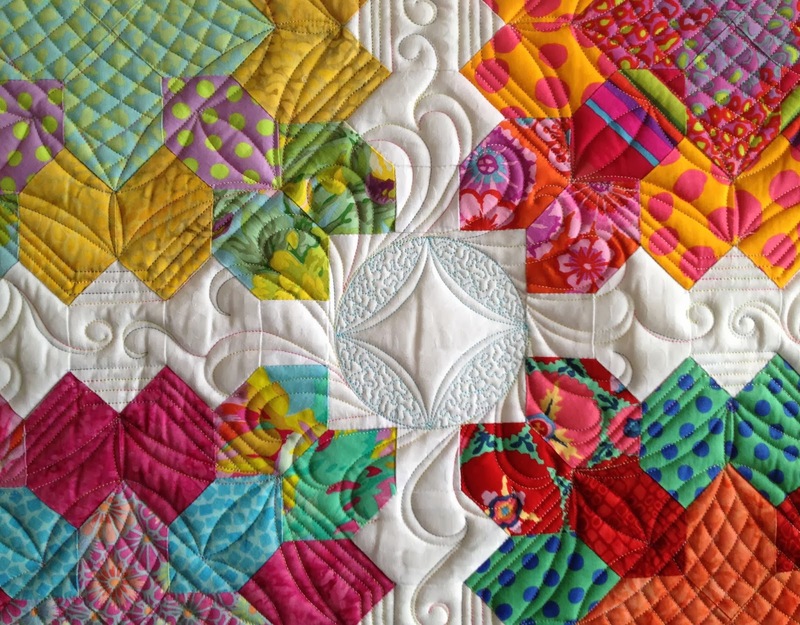 That Aurifil 40wt poly quilts like a dream, yes a freakin dream. I wish it came in many more colors than it does (hint, hint!!). So, tomorrow is NewYear's Eve. No big plans here. I have started on the client quilts again. I have a couple early January finishes for some nice, patient clients of mine. All others are being done, trust me. I'm getting it all done... :-) I worked on my own quilt (the one I showed a week or so ago) a bit lately. When I have kids home and knocking about, I hate to put a client quilt on the machine. I just don't have the attention span a custom quilt needs. So...I put my own quilt on. 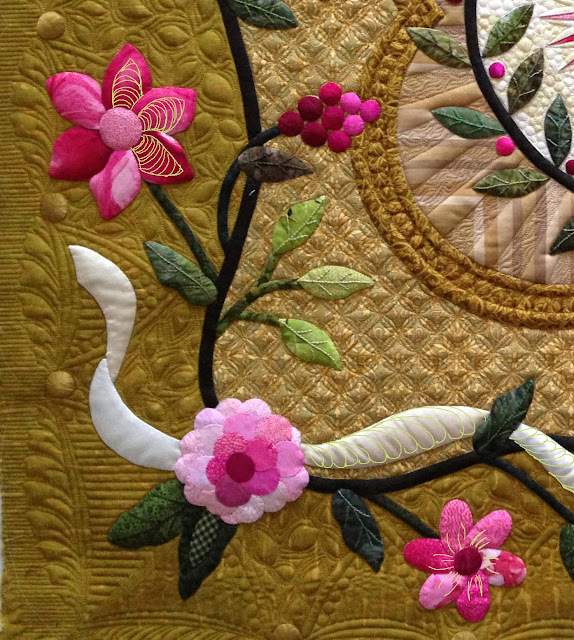 I am doing the ever-so-slow finishing touches to this show quilt, in hopes of having it done to enter in 31 days. Fingers crossed. For everything I finish, I discover something else that didn't get done right. What a vicious cycle! It's been too much work to settle for "good enough". It will be finished right, or not at all. Our family had our Christmas celebration with my husband's parents yesterday. We were bumped up a day, with little warning after learning about the ice storm that is hitting us today. This wouldn't be a safe day to be driving around. I have been a very busy person the last few weeks. I didn't even have this little runner quilted until last weekend. Thank goodness the binding is a relatively quick sew. This was started 2 years ago in a Harriet Hargrave class I took on invisible machine applique. I had half of the appliques done way back when. I'm not really sure why I never finished it, but I didn't make any Christmas presents last year so that probably has something to do with why it sat so long. The other (and obvious) is that it really is not my color palate. I was given a layer cake years ago at a retreat, and it just sat, and sat. I didn't have anything to use it on, but I did bring it to this class, and this was started with it. The background is made up of several white and red French-style toile prints. When it came time to finish the applique, I am now on a new domestic machine, and I have no idea what stitch or what settings I was using 2 yrs ago! The blind stitching on half if it is slightly different if you know to look for it. Oh, well. We call it blind for a reason...it doesn't really show much. 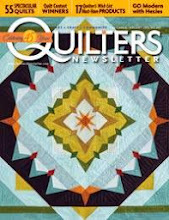 My MIL isn't much of a stitcher, and certainly not a quilter so I doubt it will be detected. Then again, I'm not really sure she liked it whatsoever -- a risk always faced when making gifts. 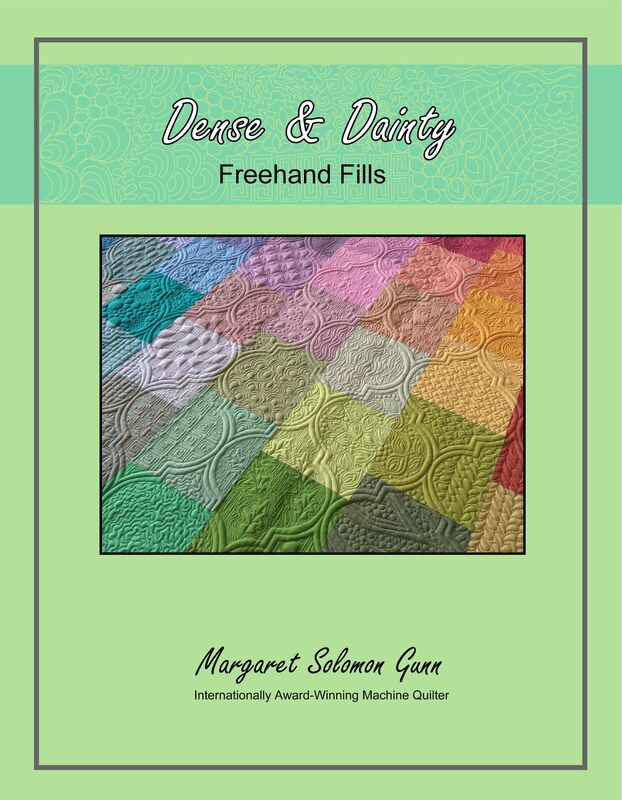 The quilting is with Glide thread. The background has the free-feathers all over it. Fortunately, the appliques are simple and do just fine with ditching and simple quilting on them. No need to overthink it. 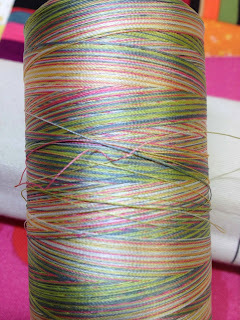 And I do like a scrappy border, and the parallel lines are just what it needs. I even did the binding in scraps of the darker reds. It all works. I like it. It is nice work. Not my colors and designs, but nice. It at the very least warranted those words, but as I said, people that don't make handmade gifts just don't always appreciate the time and investment we put into our work. The lack of nice words is completely deflating. So...even if you hate it, compliment that handmade gift! Here's one last look at the little flower and heart. She thinks it looks Pennsylvania Dutch. I'm not sure. It's Harriet's design, not mine. I just hope to actually see it on her table sometime. Mostly, all other details in my household are ready for Christmas. Most gifts are wrapped. Food is bought. I started some homemade almond joy bars today. Guess I'll be heading to the gym tomorrow!! I'm getting down to the details on this quilt. Well, actually it came off the frame a week ago so I could quilt some client pieces. I will reload it when all design decisions are finalized (as is any needed pickout!) so I don't waste valuable time. Outlining and background quilting are done. 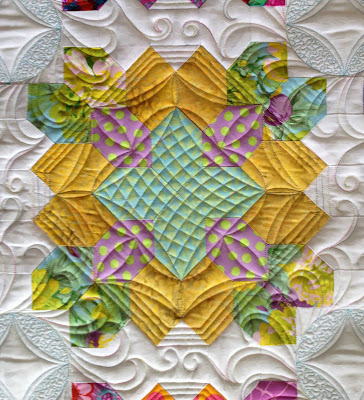 What I am waffling on is how to quilt the silk ribbons and the flowers. Some flowers really don't leave room for extraneous detail quilting, but some do. or do the flower simpler, just providing texture. I don't have an alternate idea for the ribbon besides just echo quilting 1/4" from the edge and then backfilling the center. This is not my favorite idea though. I lean towards the feathers shown above. They seem graceful. Here are 2 more flowers -- the one in the upper left and the one in the bottom right. The lower left flower will get ditch stitched around each curve and that will be sufficient. Which do you prefer?...Above is the 1/4" echo and then fill the center of the petal (upper left flower) or the spikey swirls and row of pebbles on the center circle (shown below)? 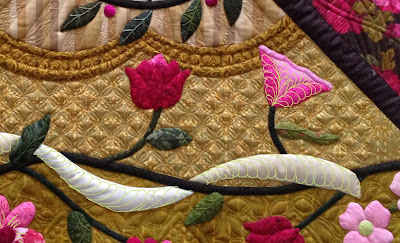 I could also just do little veins (lower flower in above pic), but this seems kind of simple, and these petals may really need more quilting. As 2013 is quickly coming to a close, I find myself reviewing the year, the accomplishments, failures, neglects, etc. 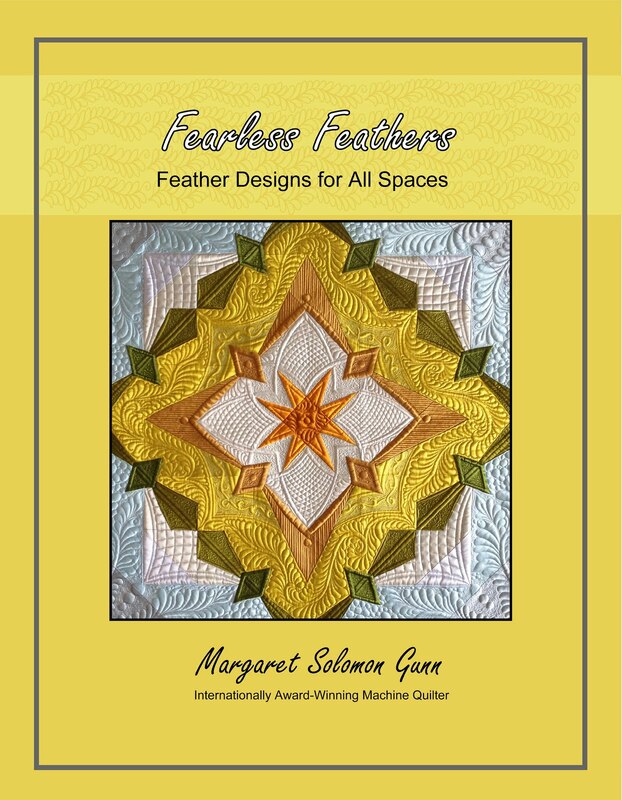 There is no doubt that this has been a pivotal year for the business and for my quilting. I have been happy all 4 years that I have been quilting, but this year has certainly had some great rewards. A huge thank you to those of you that contributed to this accomplishment list. The names are too many to list, but I know who you are. OK, they will be finished in due time. I should have kept track of thread cones purchased. It is greater! My daughter longarm quilted her first quilt this year. Yes, there are always a number of shows that your beloved quilt just comes home from, sans ribbon. I had a few ribbons also on client quilts. Memory is fuzzy, but there was a 1st at Jax Quiltfest, BOS at a prominent NJ guild show, best machine quilting at a prominent greater-Atlanta guild show, and a 3rd at NQA. My clients that dare to enter shows do well too. Handi Quilter asked me to be a part of their advertising again. Speaking of covers, sort of...Rainbow Nouveau was used for the Georgia Quilt Show's banners, catalogs and advertising this year. How cool?! I was asked to write 7 more articles for the magazine for next year. Who could refuse? 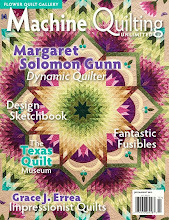 My quilts were also included in at least 3 other magazines this year as well. After not being accepted last year, this was a high accomplishment. After winning nice cash at the Lancaster show, I took myself to Paducah for the show. Zen Garden was sporting an HM, and hanging amongst the world's best quilts. Truly, this is the creme de la creme of quilts. Yup, technically better than Houston. It's gorgeous, if I do toot my own horn, just a little. 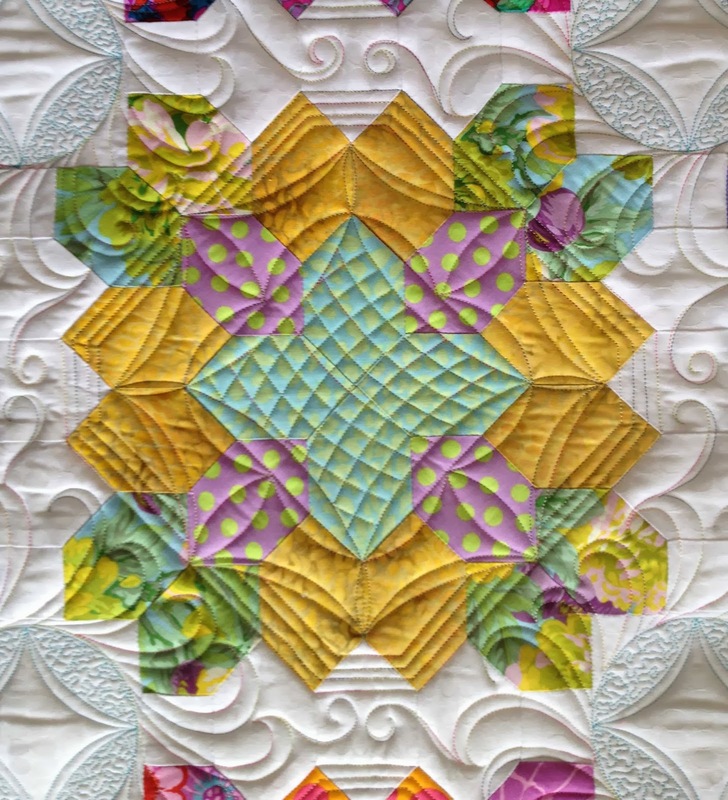 One of my new 2013 quilts, Big Bertha, was accepted into Houston this year. So, I got to experience Houston, and see my quilt in the show. Not sure I will enter this one again soon though. Many rogue thoughts for a private discussion. 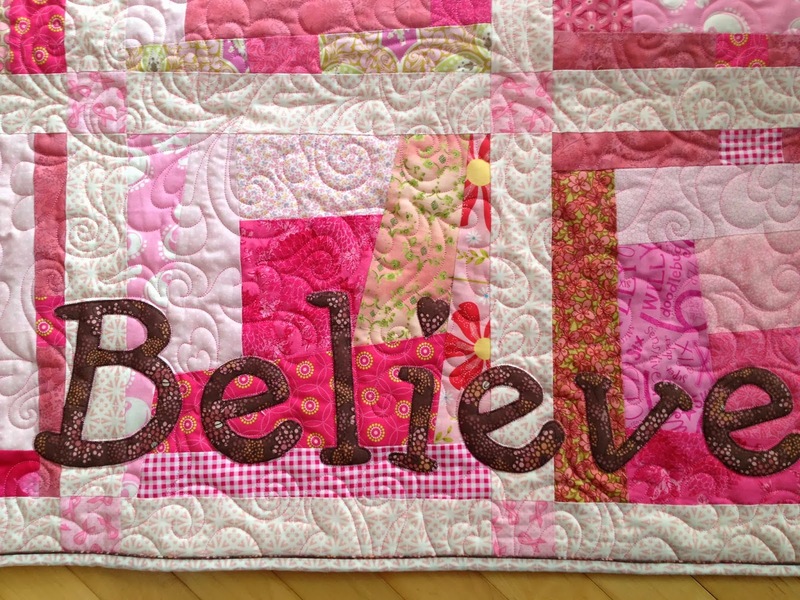 So I leave this 2013 with quilt designs running rampant in my head. ok, the book is a crazy pipe dream. The others seem more tangible. 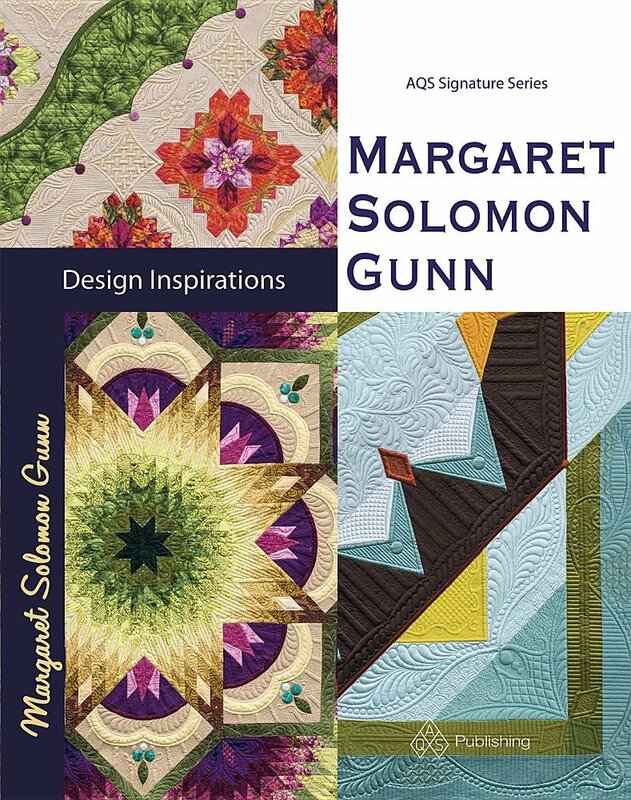 But I do have one of my own quilts that is being published in someone else's book, as well as one I quilted for someone in a different book. Not too shabby. 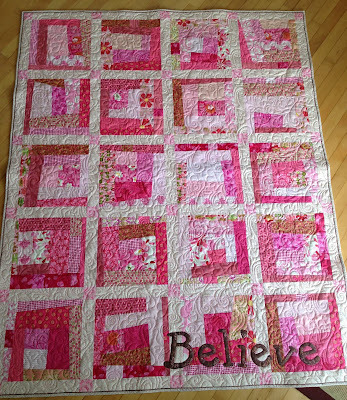 I am grateful for all the wonderful client quilts you send me. Keep making them. They give me creative license to practice what I love and to create new designs. I hope to actually quilt a couple of the tops that I seem to have been hoarding the last 12-18 months. I've met several of my FB pals in real life this year at shows, and they are great people. Only a couple more days in my schedule to putter with this beauty. I have a few last quilts to finish off before Christmas. I still have a lot to do on it, and some areas to take out thanks to tension that turned out to be less ideal. But none the less, it is coming along very nicely. here's a peek at a small (and almost completed section! ).